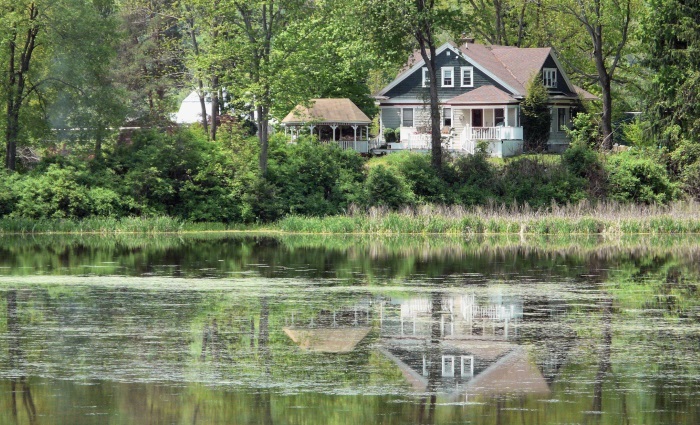 Lake Houses and Mold Go Hand in Hand, or Do They? While Mold may be relatively common in Lake Houses, does it have to be? Lake Houses are the perfect getaway. There is nothing quite like waking up to a steaming hot cup of coffee on the deck while watching the morning mist rise from the still, glossy water of the lake. What can ever ruin this perfect oasis? One word, MOLD. Mold can be highly toxic and for someone allergic to mold, it can be a severe health concern. Lake houses make the perfect incubator for mold growth due to the dark, moist environment that usually accompanies a lake house. And, since it is normally closed up for the winter months, there is even more possibility for a mold contamination. When a building, such as a lake house, is closed up and has little to no ventilation, mold has the opportunity to grow and contaminate the structure. To prevent this mold growth, make sure that moisture and humidity is reduced as much as possible. You can increase the ventilation throughout the house by leaving the interior doors open and should address moisture issues promptly. Check on the condition of the roof and make sure there are no leaks or minor damages that could become larger and allow water in. If the property is heavily shaded, you may want to consider taking down or trimming excessive trees and branches on the property so that more sun hits the home. If the property will be unoccupied for any length of time, draining the pipes and turning off the water in the winter so pipes don't freeze and burst is highly recommended. Don't forget to remove all water from the house such as water in the toilet bowl, or water in the bottom of the dishwasher. Any presence of moisture can create the perfect environment for mold growth. It is also a good idea to make sure someone periodically checks on your property in case there are any issues, so they can be addressed early on. What if you already have Mold? If you already have a mold situation, it is possible that your only recourse is to talk to a professional Mold Remediation Company. If the area that is affected is not considered a contamination, or less than 10 sq ft, then it can be wiped with a soft cloth and a mild detergent, such as Dawn. Do not use bleach for cleaning a contamination, it can actually promote mold growth. Anything larger than 10 sq ft should be remediated by a reputable company with training and experience in mold remediation. Ask for proof of proper liability insurance, as General Liability does not cover inadvertent mold growth due to improper remediation. A separate Pollution insurance is needed to cover mold that may be caused by the improperly trained contractor. While Mold can be a cause for concern, preventative or restorative measures can be taken to ensure your property is suitable for occupancy. Then, once again, you can enjoy what lake front living is all about and sit on the deck with a glass of wine watching the sun set majestically on the rippling lake. *This story originally appeared in the July 2016 issue of Connections Magazine, as part of a monthly contribution made by Disaster Blaster, Inc. Please check out the current issue of Connections Magazine for this month's story!